Mormon’s testify that Jesus Christ is The Son of God. The Mormon Church teaches that Jesus Christ lives, that he is a resurrected being, a member of the Godhead, that it is through Jesus Christ that mankind can be saved from sin and redeemed from our fallen state. Only through Faith in Jesus Christ can a person receive blessings of the Gospel essential to our eternal salvation and exaltation. Because Jesus Christ is the literal Son of God He is deity. He inherited mortality from His mother Mary. Jesus Christ alone as the only begotten Son of God in the flesh had the power to overcome death yet because He was also mortal he was able to be fairly tested by Satan as are all of us and he had the ability as do all mortals to die. Mormons believe that Jesus Christ lived a perfect life. He was sinless. Because He was ordained from before the world was created to be the Savior of mankind, because of His status of deity, because of His spotless life, and because He willingly took up on himself a tabernacle of mortality, He was uniquely qualified to be our Savior. He and He alone possessed the power to save us from our sins and to redeem us from death. He exercised His power over death on the third day following his crucifixion by rising from the tomb, His Spirit and body reuniting to never again be separated. Not only did Jesus Christ overcome death for Himself, but for all mankind. Indeed, Mormons literally believe the Bible passages that teach of the resurrection, and that it will apply to all mankind, and that we will be physically resurrected as was Jesus Christ. Mormons believe that whether righteous or wicked we shall all one day be resurrected because our Heavenly Father willingly sent His Son to the earth as a spotless and perfect sacrifice to pay the price and redeem us from death. Additionally, Mormons believe that it is through the Atonement of Jesus Christ that our Heavenly Father can forgive us of our sins. While the gift of salvation from physician death (resurrection) has already been paid for and will apply to all mankind regardless of our intent to follow Jesus Christ, Mormons believe that to fully benefit from the Atonement Jesus Christ provided we must have faith in Jesus Christ, repent of our sins, receive the Holy Ghost and endure to the end by following Jesus Christ. Forgiveness from sin is conditional upon repentance. Repentance includes forsaking the sin. Mormons teach that following Jesus Christ includes being baptized to become His follower and this is the entrance into His Church. 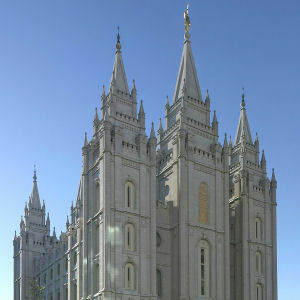 The Mormon Church is officially called “The Church of Jesus Christ of Latter-day Saints”. So as the name of the Church implies, Mormon’s believe that when they are baptized, they become members of Jesus Christ’s Church. Indeed, Mormons strive to follow Christ’s teachings. In fact, that is what their religion is about. As a practicing member of The Church of Jesus Christ of Latter-day Saints, I can proclaim to all that what matters most to any of us is our Faith in Jesus Christ, our personal relationship with Jesus Christ as our Savior and Redeemer, our application of Christ’s teachings for how we should live our life, our profound conviction and testimony that Jesus Christ is the living Son of God, and our belief that He will return again to rule the Earth as Shiloh, the Messiah, the Holy One of Israel, the Redeemer of the World. Indeed, to Mormons, Jesus Christ is the Author and Finisher of our Faith. In a world where the religions of the day debate over details of much of what was just written in the preceding sentences, and in many instances define beliefs below the standards outlined here, it is refreshing to me personally to have found a Church to which I can belong where members of the Church believe in Jesus Christ as the literal Son of God, in His physical resurrection, that His Atonement will indeed save us from death and sin, and where for the most part the general membership of the Church truly strives to follow the teachings of Jesus Christ throughout each day of their life. This Mormon Blogger is truly thankful for having found the Mormon Church!